Let’s be honest, if you’re a rider and get in an accident on the road, your risk for injury is far greater than if you’re a cager (someone who’s driving inside their secure metal “cages” or cars). Drivers of 4-wheel vehicles are surrounded by steel and airbags that are designed to protect the occupants. For riders, we’ve got our helmets, riding gear, and the hope that a flatbed truck carrying pillows is there to catch us when we land. There are ways, however, to protect yourself on the road when you’re riding your motorcycle. From wearing a helmet, to adding a pulsing brake light to your bike, there are safety precautions. But there are things to be aware of while on the road, that will protect you and could possibly save your life. I know, I know. I’m not your dad. And this seems like common sense, but if you’re driving too fast and reckless on a four-lane highway, you’re asking for it. Most times, the problem with going fast isn’t that you’re going fast. It’s that motorists around you don’t see you. No matter how bright your clothes are. It doesn’t matter that you are pumping the brakes. Sometimes motorists just don’t see you. If you’re a rider, it’s probably best to just assume that the people around you don’t see you. 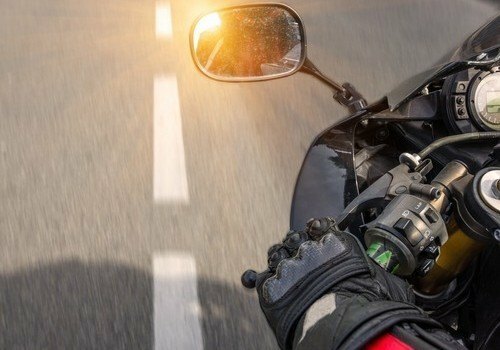 Some of the most common causes of motorcycle accidents happen because other motorists turn in front of you, cut you off, merge into you, or you simply get rear-ended by another motorist. Remember driving school when they probably told you about the faster you go, the longer it takes to stop? That rule applies here. The faster you’re going, the longer distance it takes for you to stop. Just be aware of the conditions you’re driving in. If you’re on an open road, that’s one thing. If you’re surrounded by cars, slow it down. Again, seems pretty straightforward and simple, but if you notice the tops of the car’s wheels, you’ll be able to get a good idea of whether or not the car turning from a side street is a threat to you. The tops of a car’s wheels move faster than the car itself. If you’re not sure a car is moving from a stopped position, you’ll be able to tell faster if you look at the wheels than the entire car. If you see a car’s wheels start to move from a side street or driveway, assume the driver doesn’t see you. You might be familiar with this, but for new riders, covering your brakes simply means putting your hand or foot on the brakes to get ready to stop at a moment’s notice. This is especially important when you ride through intersections. The longer it takes you to move your fingers to the brake, engaging your brakes (and pulsing brake light), the longer it will take you to stop or slow down – which will increase the chance of someone rear ending you, or hitting you from the side. Cars won’t know if you’re simply slowing down. Remember, they often times can’t even see you, so the chances of them gauging your speed and activity are reduced. Covering your brakes rather than just slowing down could save you from an accident. These motorcycle safety tips might all seem like common sense. However, an important thing to consider when riding is that doing the things that seem like no-brainers early and often could help you stay safe on the roads.